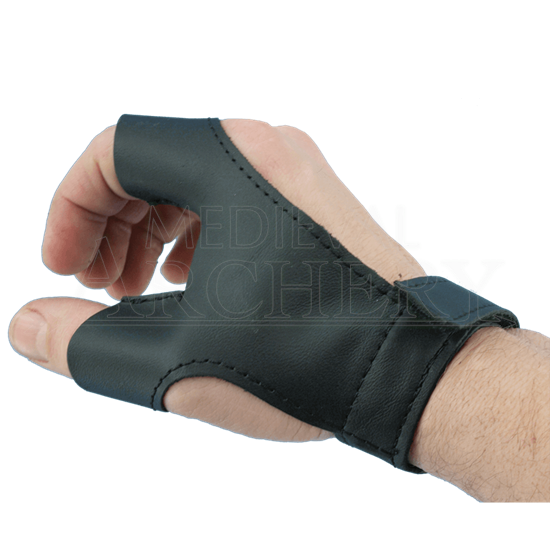 This Archers Hand Protection is meant to protect the hand that holds the bow. Keep your bow-hand properly shielded from passing arrows and recoiling strings. This leather glove is a must-have for both traditional and LARP archers. Stitching reinforces the structure and follows the edges of the archery glove. The glove slides onto the index finger and thumb. Adjust to your comfort and fit via the Velcro strap found at the wrist. The Archers Hand Protection not only comes in multiple sizes, but with the option for either the left or right hand. Order according to the hand this item will be worn on. If you order a 'left' you will receive a guard that is worn on the left hand. Please be aware that these are hand-made from leather. The size can vary between 1/8th to 1/5th an inch, depending on the leather.